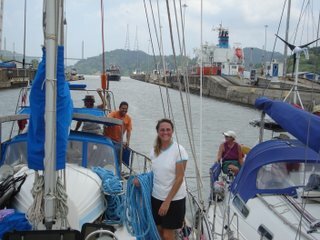 After spending two weeks here in Panama we decided we deserved a break from the burning tyres at night and constant wash from passing tug boats. 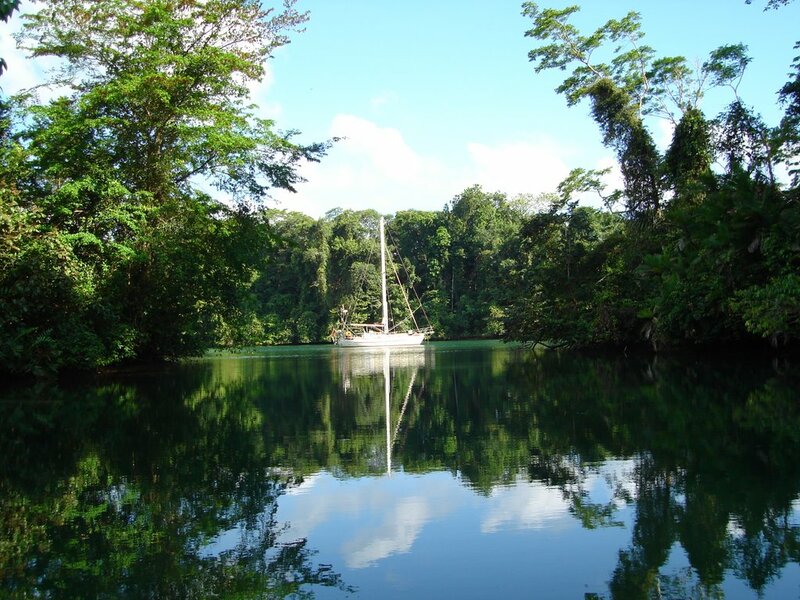 We took R2 out of the harbour and took a short trip down the coast to the River Chagres. It was out of this world. 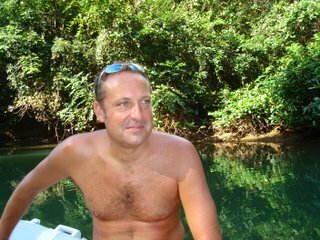 It is a river that runs through the jungle, complete with crocodiles, parrots, monkeys and all sorts of other wildlife. Zeffrin came with us and we had three fabulous days listening to the jungle noises, exploring the creeks in the dinghy and generally enjoying the peace and tranquility. We wished we had come sooner. 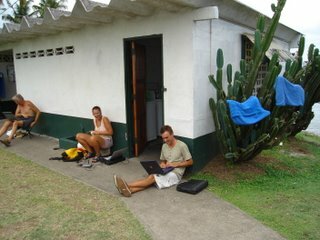 This is how we check our email at the Panama Canal Yacht Club. Mike, Alyssa and Nick online for free! They are not our towels drying on the cactus. 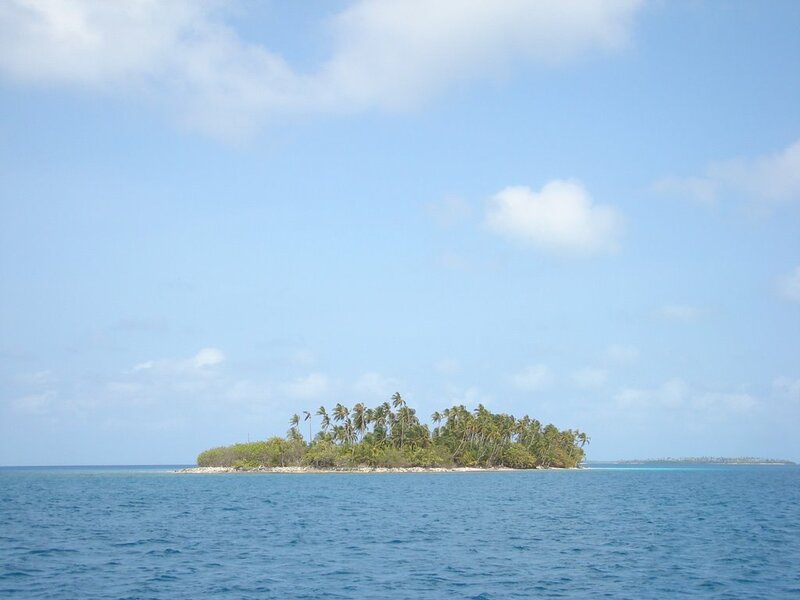 We spent five incredible days in the San Blas Islands. Our second day took us exploring the islands around the anchorage by kayak, snorkeling on the reef and getting our first experience of the way the Cuna Indians live. We met a couple of cruisers who had almost moved onto one of the uninhabited islands - they had their washing hung out, a hammock set up in the palms and a bbq area, they�d been there for months! We went on a conch hunt and managed to collect 10 conch so we cooked up a fantastic curry that night. The next day we headed west a little to the Lemon Cays, catching another wahoo and another large fish on the way - who needs supermarkets?! We arrived at an anchorage between two islands - Banedup and Nuanedup. As soon as we anchored we were surrounded by Cuna Indians in dug out canoes trying to sell us Molas. Molas are a type of tapestry made by layering fabrics - the Cuna women wear these along with layered clothing, beads wrapped around their arms and ankles and rings through their noses. The women were generally very shy and polite. The men were very friendly and seemed to be keen to talk as much as sell things. We bought a couple of molas and traded rice for bread and coconuts. We visited Banedup where the Indian�s made the bread - they welcomed us to walk around their island and their homes. We met a little man who was 81 who spoke excellent English but unfortunately was as deaf as a post but we chatted to him for a while and learned a little of his life working on the panama canal. Our last day in the San Blas took us to Chichima Lagoon after buying 6 small lobsters and a huge crab for the equivalent of about 4GBP. The man who sold them to us brought two of his Children to meet us but they were too shy to even look at us until they had left R2, then they kept looking over their shoulders - very cute. Chichima was our last stop before we headed for Colon on the mainland of Panama. 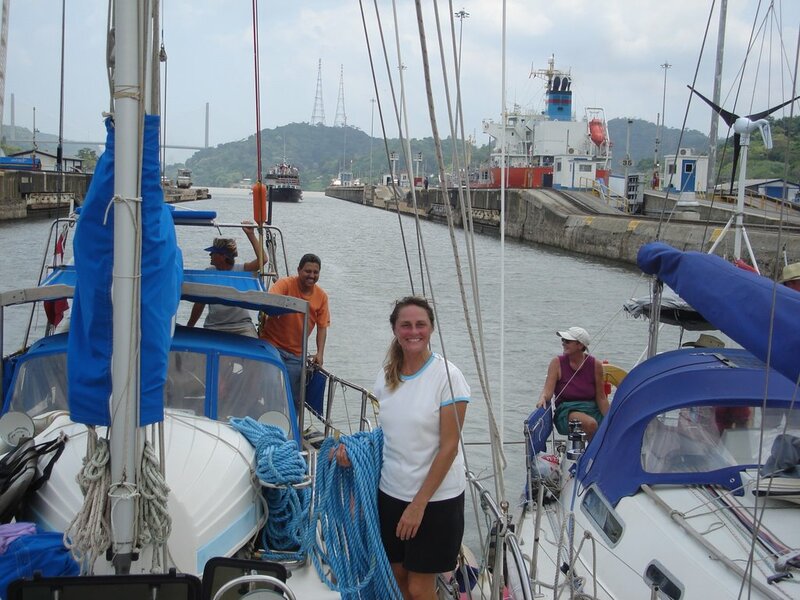 The trip to Panama was an overnight crossing which brought us into the approaches of Colon at fist light on 11 April. I had been sleeping and woke as we approached, I couldn�t believe my eyes when I saw the number of ships all around us. Andrew had been doing an amazing job monitoring them all. I counted over 30 waiting to enter the harbour. As we approached the breakwater Andrew called the signal office on the radio and they instructed to pass through and call them when we were in. The breakwaters shelter a huge expanse of water full of ships with docks and tower blocks all around. This was all very strange after the paradise of the San Blas. We came into the anchorage and immediately spotted our friends John and Elaine on Goolka and Nick and Ellen on Kika as well as three other boats we know. John put the coffee on and explained how the formalities work for arranging the canal transit. Andrew has now gone to clear in and arrange an agent for us to make the arrangements which include visiting about five different offices, having the boat measured, hiring 4 very long ropes, depositing a large amount of money at the bank and arranging line handlers to accompany us on the transit. All a lot to take in but it appears that the cruising community is set up here to help. We will probably transit the canal with John & Elaine as two of their line handlers so we know what to expect when we take R2 through. It is likely that we will have to wait 2/3 weeks for transit - so watch this space for news from Panama. We had probably the best sail this year from Curracao to San Blas. We had perfect winds of 15-20 knots right behind us all the way. The weather was hot and dry and the sea was gently rolling with us. We had peaceful night watches with only the odd ship passing by and the occasional visit from a flying fish. We had really good current with us so were flying along so much that we had to slow down on Thursday and took the chance to practice heaving too (basically stop the boat just off the wind by balancing the sails - this is what we would do in a storm). While we were playing around some dolphins came to see what we were up to. Just after the sun came up on Friday morning palm trees appeared on the horizon in little bunches - this was the San Blas. We approached carefully as you cannot rely on charts for coral atols as they are always changing. The closer we got the more exciting it was. These islands all look like something out of the movies and there's hundreds off them. Sand fringed islands just above sea level covered in palm trees and nothing else. We had a reality check as we saw the hull of a yacht wrecked on the reef as we approached Hollandes Cays. We passed in through the islands and reefs into calm waters behind. I was nervously watching for reef patches on the foredeck when the fishing reel went as we'd caught a fish. After a quick fish drill Andrew landed a reasonably sized Wahoo. We edged our way into a lagoon behind a largish island and anchored just off the most perfect beach with islets dotted all around us. They call this area the 'swimming pool' so we immediately grabbed our snorkels and went exploring. The first fish we saw was a huge sting ray swimming just beneath us - amazing. We explored the reef and then swam to the island. Completely uninhabited and totally beautiful - I cannot describe you'll just have to wait for pictures - we felt like we had arrived. We walked to the windward side of the islands and snorkelled in huge hot pools behind the reef. We found a conch and were really excited so went hunting for more and found enough to make a small meal. We also found a lobster but without anything to catch him he was a little too vicious and went for us when we went near him so we left him under his rock. We swam back to R2 with our second catch of the day. Early evening we pumped up the kayak and paddled over to another island. Two small settlements exist on this island - Cuna Indians. Their houses were wooden huts with roofs made from coconut palms. The areas around the houses were neat and orderly. There is no water supply or electricity on the island. They have small fishing boats with sails as well as canoes that they take off for the day fishing. We headed back to R2 for a feast from the seas. We had spicy conch chowder followed by wahoo and salad - what a yummy treat. We hope to spend a few more days in this paradise before heading for Panama. We had such a great time in Bonaire we thought we might never leave but on Friday we dropped our mooring and had a fantastic day sail to Curacao. 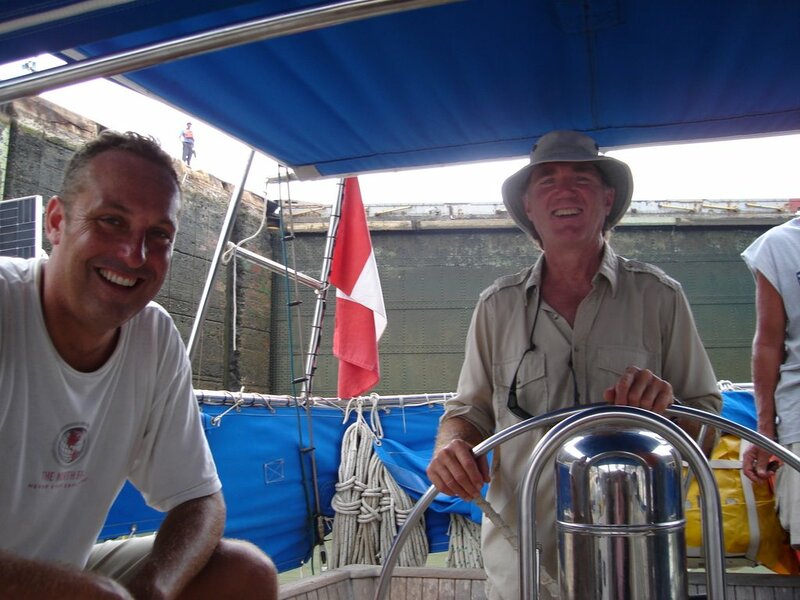 We anchored in an enclosed area called Spannish Water, it was not quite a beautiful as Bonaire but had it's own charm of mangroves and houseboats, sailboats whizzing about and a great little bar set up to help cruisers. Clearing in took us on a bus to Willemstad the capital then on a ferry across the river that separates the town. Luckily they let us clear in and out at the same time as we were only staying a couple of days. The town is really clean with lots of bright coloured buildings in a dutch style. It's been along time since we were in such a busy place but we really enjoyed it. Unfortunately we had to buy a new camera as the old one got a bit damp on a diving trip in Bonaire and didn't like it. We managed to bargain for a good deal so we are up and running again. We stocked up on fruit and veg in the Venezuelan market - rickety boats bring the produce and they sell it on the dockside. It was funny trying to talk Spannish again but we got by even if we are not sure what some of the things we bought are. After two days in Curacao we decided to push on. We passed Sandy & Joan coming in the channel as we left Spanish Water and set sail towards Panama. 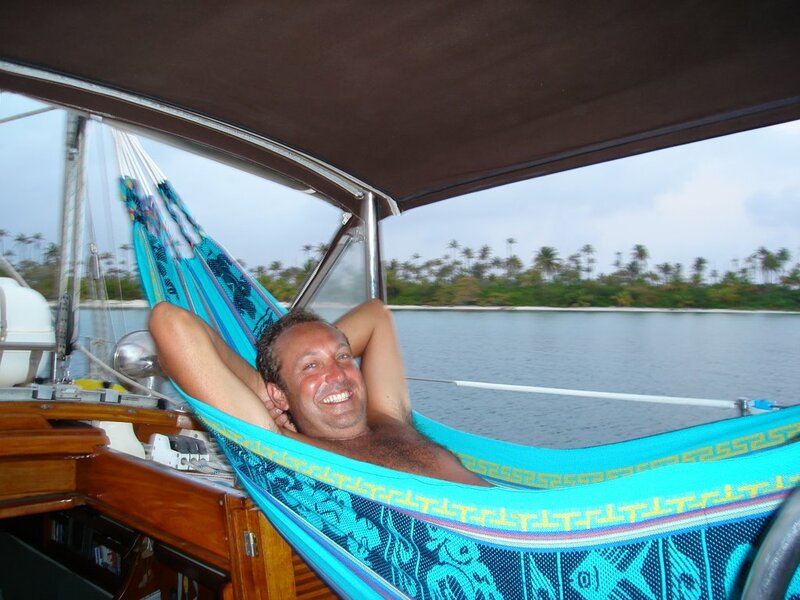 We are hoping to visit the San Blas Islands off the Panama coast for a few days before heading to Panama to arrange our canal transit into the Pacific. All is going well at the moment and we are getting used to being at sea once again - rolling along with the wind behind us. Position 1830 GMT 1326N 7350W. We have to stay quite a way off the Columbian coast as it can be very windy and the best current is out here. All being well we should arrive on Friday in San Blas.